Changes to knockback, damage boost, and individual hero updates may alter the game. 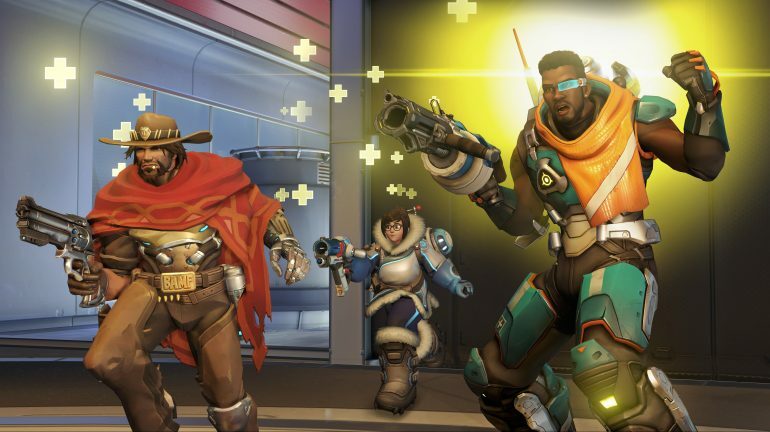 A whole lot of changes are coming to Overwatch, according to the latest patch notes for the game’s Public Test Realm (PTR). The addition of Baptiste, the game’s newest hero, is the biggest change on the PTR. Tiny tweaks to individual heroes and ultimates all add up to, hopefully, a more consistent experience for players. The PTR patch note overview from the Blizzard forums outlines some critical changes to how the game works. First of all, sounds have been changed because of Baptiste’s damage amplification abilities; a new sound plays when a hit is damage boosted and another sound plays when a hit does no damage because of nullification. Beam-type damage has been reduced by 20 percent when hitting armor. This means attacks like Symmetra’s Photon Projector will do more consistent damage. Damage over time abilities, like Widowmaker’s Venom Mine, will now not be affected by armor. Damage boost is now applied when a projectile is fired rather than when it hits a target. For example, if Mercy is damage boosting a McCree, the McCree now only has to be boosted when the shot is fired, not when it hits the opponent. This allows for more consistent tracking of damage boosting. Knockback has been improved so that heroes who are flying or moving, like D.Va or Doomfist, can be knocked back. All heroes will have a more consistent knockback distance as well. Watch out for those new and improved Lúcio boops! Many heroes have had minor to major changes to their kits. Ana’s Nano Boost healing has been reduced from 300 to 250. Doomfist’s Rising Uppercut and Seismic Slam abilities have a reduced cooldown: six seconds instead of seven. Hanzo’s Sonic Arrow has a radius of nine meters instead of seven, to see more. Lúcio’s Sonic Amplifier (or “boop” colloquially) will now count towards offensive assists if an elimination occurs because of it. McCree’s Fan The Hammer damage is reduced to 50 from 55, but his biggest change is to his Deadeye ultimate. Damage is increased from 275 to 550 after locking on for 2.5 seconds. Mei’s Endothermic Blaster damage is increased to 55 damage per second while her Ice Wall now only has 400 health instead of 500, making it easier to destroy. Moira’s Biotic Grasp is more viable; total healing has been increased to 65 (instead of 50). Orisa’s Fusion Driver ability has had its movement speed penalty while firing reduced from 50 percent to 30 percent. Orisa can now move faster while fending off enemies. Pharah’s Rocket Launcher ability has had its minimum explosive damage increased from 16.5 to 20, which is a reversal of a change a few patches ago that reduced the ability’s damage. Soldier: 76 has a host of changes to make him more viable in the current meta. Pulse Rifle damage is up from 19 to 20, the delay on using weapons after sprinting is reduced to .3 seconds, and his ultimate can target Junkrat’s Rip-Tire and Baptiste’s Immortality Field. Sombra’s cooldown when hacking a health pack is reduced by half, making it easier to utilize hacked packs. Torbjörn’s base health has been increased from 200 to 250, but his Overload armor gain has been reduced from 150 to 100 to compensate. Widowmaker’s ultimate, Infra-Sight, now reveals enemy health bars but is canceled upon death. This means her team can’t take advantage of the ultimate if she is eliminated. Wrecking Ball’s Adaptive Armor will now not cancel him out of Roll mode, increasing his ability to survive in fights. These changes are live on the PTR as of Feb. 26. The changes are normally put onto live servers within the following week. Get practicing and see how your favorite heroes have changed with these fixes!